What is the yearly Alberta On-Line membership fee? We can tailor a Full Service Value Package that suits your business needs & multiplies the effectiveness of your current marketing efforts. We connect it seamlessly with your existing online presence to give your business 3 additional points of contact with your customers! How do I become an Alberta On-Line upgraded member? From your dashboard go to “Membership Info” and click the link “would you like to upgrade your account”. This takes you to the “Become an Exclusive Member” page. Scroll to the bottom and click “Upgrade Today”. Membership length - choose 12, 24 or 36 months. Social media - Add any links for your social media accounts *You will need to copy and paste the actual URL from your social media page* your user name eg: @myname won't work. Once you hit “Save” it will take you to the “payment” page. Enter the “Referral Code” if you have one and/or a “Discount/Promo Code” if you have one. Choose “save” and your account is upgraded. Proceed to “payment”. Go through the Paypal payment options. Choose “save” and your account is upgraded. How do I choose, create or edit my Alberta On-Line membership page? Go to “My Account” and choose “Edit Template”. How do I upload or edit my photos and comments? Scroll down to add your text and images. For images click on button that says “Add image”. A box titled “CKFinder 3” will appear. Choose “Upload” to choose where you get your image from. Once you have uploaded the image, click on the image. Then click on either “choose”, “choose resized” or “edit” to get the desired image size, cropping or filter. Once you have chosen your image it will take you back to “Template management”. Add your text in the box (or boxes) provided. Go to “My Account” and choose “View my member site” to see how it looks. What is the "Dashboard" and how do I use it? What does my Alberta On-Line Directory (upgraded) membership do for me? Your membership allows you to create your own custom membership page and perform self-updates to change the content of your page. It allows you to list your membership page in up to 5 different classifications. Giving you five times the exposure! As an upgraded member you are able to place Deal Checker listings and Classified ads. You are able to create an unlimited number of Deal Checker pages, either category or city, per upgraded membership page. 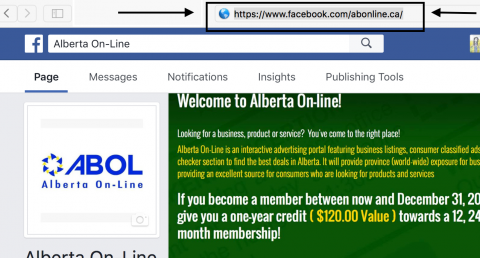 What does my Alberta On-Line membership number do for me? Your membership number allows you to refer others for membership. For each referral that becomes a paid member both you and the referred member will receive a one month extension on your paid memberships. How do I pay for my Alberta On-Line membership? Use the secure link to go to Pay Pal and follow the prompts. You can also use your own credit card through Pay Pal. How do I create more than one Alberta On-Line membership page? Go to the log in page and select “Create an account”. Fill in the required fields and you are done. Please note that each membership page needs a different email address. Your email address is how we identify each member page on the site. Go to your “Dashboard” and under “Settings” choose the “yes” option and choose your key words or phrases . How do I change my Alberta On-Line membership classification? Then go to “Membership Info” and choose “Update Profile”. Go to “Categories” and choose “Change Categories”. Here you can add or remove categories or choose to make your membership page a Featured Business in the category of your choice (note: a fee does apply for listing as a featured listing). Can I change my Alberta On-Line membership page template? Go to “My Account” and choose “Edit Template” and make any desired changes. How do I view an Alberta On-Line member's full membership page? Go to the “Directory” page and choose a member from one of the categories. Click on the member’s page and the full membership page will be displayed. Going to the bottom of each membership page will allow you to view their Classified listings and Deal Checker pages if they have any. How do I become one of the “Featured Five”? Go to your “Dashboard” and under “Membership Info” choose “Update Profile”. The scroll down to “Categories” and choose “Change Categories”. A screen showing your chosen categories will appear. Under “Feature” choose 3, 6 or 12 months and click “Buy”. This will take you to the payment screen. You can also change the categories that your membership page is listed in by adding or removing category changes. Note: Make any changes to categories prior to choosing to make them featured. Otherwise you will lose the featured ad for the category you no longer are a part of. What is the cost of becoming one of the “Featured Five”? The cost of becoming a featured five listing is $25.00 per month per listing. What is the Waitlist for the “Featured Five”? The Featured Five is limited to 5 spots per classification. The waitlist will notify you by email once one of the spots becomes available.